We were really excited to be invited to the screening of Disney The Lion Guard :Return Of The Roar, Following on from the 1994 Disney Movie The Lion King, The Lion Guard continues the gripping story-line with this feature length special movie which will be coming to our screens on Monday 8th February at 5.30pm on Disney Junior. The Lion Guard:Return Of The Roar is set in Africa, The movie follows Kion the son of Simba and Nala, Its time for Kion to take leadership and build a new lion guard to protect the circle of life, Kion soon sets to build the best lion guard ever by assembling his best and most fiercest and fasted friends, from his best friend Bunga the brave Honey Bager , Fuli the fast cheetah, Beshte a strong hippopotamus and Ono an eyed egret. Kions father Simba is disappointed with Kions Lion Guard choice and feels his not taking his responsibility seriously, Simba explains to Kion that the lion guard should be made up of a group of lions. This leaves Kion sad and doubtful about his new role, but the spirit of Mufasa appears and encourages Kions not to give up. Kion is soon faced with his biggest challenge when his sister Kiara is caught up in the middle of a gazelle stampeded as a group of hyeneas set to cause a stir. Kion assembles his lion guard to rescue Kiara and drive away the mean hyeneas, Within no time the new lion guard has achieved its goal and proven its worth. Simba is so impressed and accepts them all as the new Lion Guard. It was great to see some of our all time favorite characters back on screen in this fabulous new movie, The Lion Guard Return of the Roar features stunning scenery and songs that you and your family will adore. The Lion Guard Return Of The Roar is fun and gripping movie that you will love no undoubtedly want to see more of. 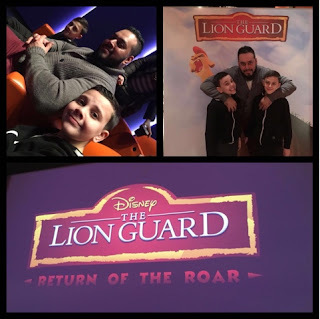 We loved watching the Lion Guard, we most defiantly cannot wait to watch it again. The Lion Guard Return Of The Roar will be making its television movie debut on Monday 8th February 2016 at 5.30pm only on Disney Junior.